Fort Lauderdale, FL – The rate of price increases at the gas pump returned to its former, frenetic pace during the past week, according to the U.S. Energy Information Administration. The weekly E.I.A. fuel price survey shows the average cost of a gallon of regular unleaded gas shot upward by four cents per gallon to $2.61. No region was spared gas price increases this week; but as often happens, the rate of the increases varied widely from one survey district to the next. On the West Coast, prices jumped by over six cents per gallon; whereas, in the Rockies, prices only nudged upward by about a penny per gallon. 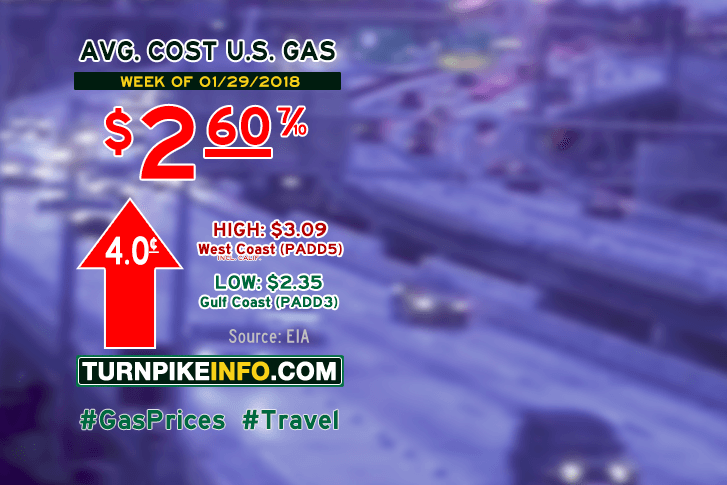 Truck drivers got hit just as hard this week, as the nation’s average price for a gallon of diesel lurched upward by well over four cents, pushing the average cost of diesel to $3.07 per gallon. Prices soared across the Gulf Coast and Midwest, where costs for truckers were up between a nickel and six cents per gallon, respectively. Fuel prices for all regions are shown below, as gathered from www.eia.gov.